Senator John E. Brooks took a ceremonial oath of office surrounded by constituents, friends, and family, in the district at Seaford High School this afternoon. Senator John E. Brooks' ceremonial oath of office in the district at Seaford High School on January 7, 2017. Seaford, NY - January 7, 2017 - Senator John E. Brooks took a ceremonial oath of office surrounded by constituents, friends, and family, in the district at Seaford High School this afternoon. He officially took his oath of office on January 4th, 2017 in Albany, New York. Senator Brooks, knowing that many community leaders would not be able to attend the official swearing in, he organized the ceremony to include everyone from the district and Long Island. It was held at Seaford High School to highlight the Senator's commitment to public education. Democratic Conference Leader Andrea Stewart Cousin administered the oath of office. Senator Brooks represents the South Shore of Eastern Nassau and Western Suffolk counties of Long Island, including Freeport, Merrick, Roosevelt, Bellmore, Wantagh, Jones Beach Island, Seaford, East Massapequa, Massapequa, Amityville, East Farmingdale, Wyandanch and Lindenhurst. His district office is located at 5550 Merrick Rd, Suite 205, Massapequa, NY 11758, and can be reached at 516.882.0630. Dame Helen Mirren & Tony Yazbeck Surprise Audience at East End Arts 13th Annual Teeny Awards Ceremony! 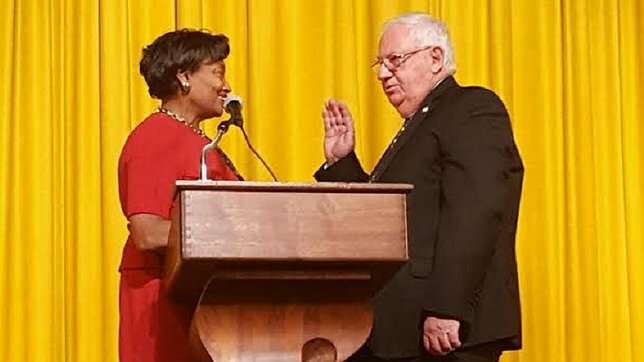 Subject: LongIsland.com - Your Name sent you Article details of "John E. Brooks Takes Oath of Office at In-District Ceremony"